​ Previously Jr. Pirates/Panther Wrestling, Palatine Cobras Wrestling Club​ begins Monday, October 30 at Palatine High School under the direction of newly appointed Head Coach Jeff Keske. Participants will have the opportunity to learn the skills needed to compete in the sport of wrestling from the head varsity coach at Palatine High School​. Children of all levels, from beginner to advanced, are welcome to participate and will have the opportunity to compete in various weekend tournaments. Practices will stress fundamentals, technique, safety, and sportsmanship. The program is designed for beginners to advanced participants to ensure the best possible one on one attention for each child. Joining Keske this season as assistant coaches include, Chris Winter, Pat Hasting, Brian Kemp, Tyler Futris, and Korey Kleinhans. This coaching team will provide a wealth of knowledge for participants. Bill LaSchiava, a volunteer with over 20 years of experience, will be assisting with the club as he continues serving as club president. LaSchiava founded the club when his son was learning to wrestle and is now helping teach his grandson the sport. Headgear and singlets will be provided to use. Every wrestler will get a t-shirt and one paid tournament. Families in financial need may complete a scholarship application through Palatine Park District​. Club registration is $225 for residents, $248 for non-resident District 211 students, and $282 for non-residents. Register online at palatineparks.org​ using program number 404900-01​ or in person at Birchwood Recreation Center​, Community Center​, or Falcon Park Recreation Center​. Practices will be 6:30-8:00pm on Mondays, Wednesdays, and Thursdays from October 30 – March 15. For more information about Palatine Cobras Wrestling Club, contact club president Bill LaSchiava at 847.560.3239 or wslas@comcast.net. 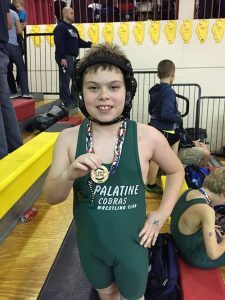 The Cobras Wrestling Club is a program of Palatine Park District.